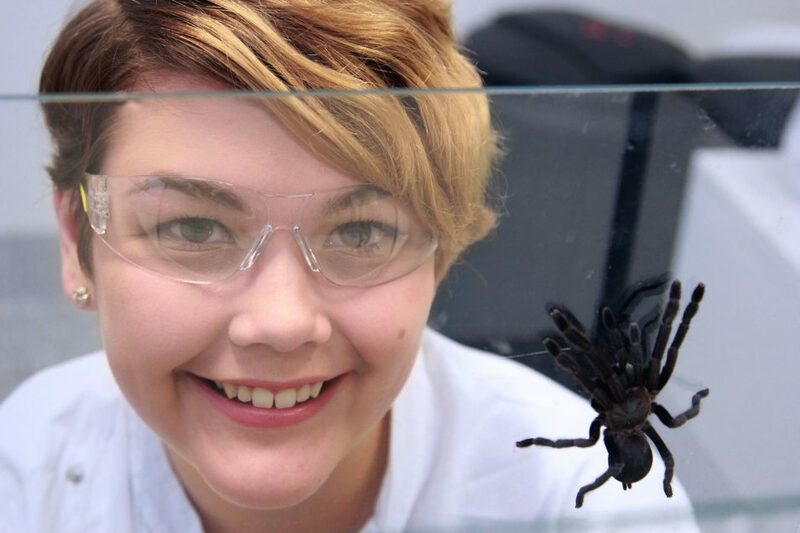 PhD candidate Samantha Nixon isn’t your average molecular biologist: she shares a lab with hundreds of spiders and spends a good portion of time sifting through sheep poo. “My job’s not very glamorous,” she laughed. Thankfully, Samantha isn’t driven by glamour; she has more important things to think about. While sorting through poo, she’s busy collecting eggs from a parasite: the Barber’s Pole Worm (Haemonchus contortus). This blood-feeding gut worm is a really nasty piece of work. “Spiders aren’t the real creepy crawlies, parasites are. Heavy infections of the Barber’s Pole Worm can drain the sheep of as much as 10 per cent of their blood volume per day. They don’t have enough energy to grow or produce wool and, as you’d expect, they get really sick,” Samantha explained. Unfortunately, the Barber’s Pole Worm is widely drug-resistant, making it hard to treat. That’s where the hundreds of spiders in Samantha’s lab come onto the scene. There are many animals that use venom for hunting or defence. Jellyfish, snakes, even our beloved platypus have venomous spurs (well, the males do). Venom is a wonder of evolution: it’s fast acting, potent, and most importantly, very selective. It’s an amazingly diverse cocktail of molecules that have lots of exciting properties. But why spiders? Surely they rank pretty low on most people’s ‘animals I’d like to work with’ scale. “Over thousands of years, spiders have evolved to produce venom that is extremely effective for killing insects. Of all the venomous creatures we could work with – spiders are most likely to have the molecular answers we’re looking for,” Samantha explained. Ok, so it makes perfect sense, but does that mean Samantha likes working with them? That last fact is yet another reason spider venom is an especially good candidate for drug research: unlike snakes, spider venoms have not evolved to target large mammals, like us, so their venoms are generally less dangerous to us. However, we can’t just inject spider venom directly into people. Firstly, there’s simply not enough spider venom to go around, and secondly, the venom will still pack a painful punch! So Samantha is working to isolate the venom into different molecules and find the perfect compound to treat diseases. 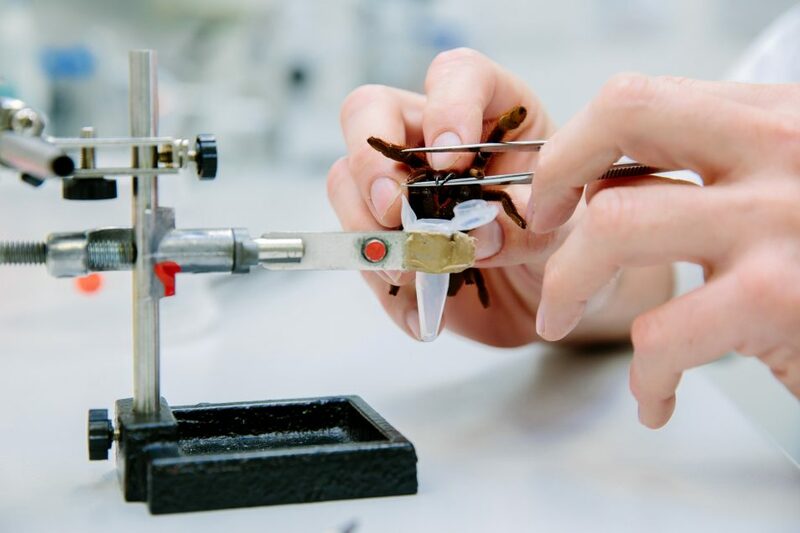 This isn’t just a theory by the way – spider venom has been turned into lots of incredibly useful medicine and is used to treat chronic pain, epilepsy and even reduce the harmful effects of a stroke. You probably wouldn’t guess it, but many spiders are actually reluctant to bite as a defence (another reason to stop being so scared of them). But from even a small sample of venom, Samantha has a lot of work to do. While Samantha’s focussing mostly on finding a venom to stop the Barber’s Pole Worm, it’s not her only goal. One day, it’s quite possible Samantha will make a discovery that can save hundreds of thousands of lives. Suddenly, sifting through a bit of manure and hanging with spiders all day doesn’t seem so bad. You can! Join her at Pint of Science.